Installing sensors in your home doesn’t have to be an overwhelming or frustrating task—it’s usually as easy as peeling a sticker and placing the sensor on just about any surface. However, it does take some planning to find the perfect place for each sensor to ensure that the sensor is as effective as possible. In this article, we’ll help you determine the best place for different types of sensors and give you some installation tips. Carbon monoxide (CO) is an odorless gas that can be lethal if undetected. A CO detector will alert you by beeping loudly if there is a high presence of carbon monoxide in the air, giving you a chance to get everyone out of the house to safety. 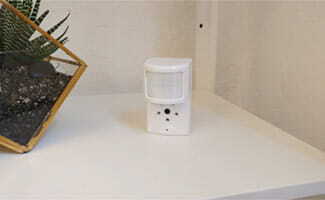 If the CO detector is connected to your security system, it will alert the central monitoring station as well. You should have at least one carbon monoxide detector on each level of your home, and place them about five feet off the ground. Each state has different requirements on the location of CO alarms, so be sure to check what your state’s laws are. Some good locations for these are near bedrooms and in living rooms, where people are likely to sleep or gather. It’s also a good idea to place one near the door that leads to the garage, if you have an attached garage. Do not place CO detectors inside the garage or in bathrooms, close to appliances, or in small spaces like furnace rooms, crawl spaces, or unfinished attics. My home has two stories and a basement, so I have three CO detectors total. On the main floor, my CO detector is located in my office, just outside the kitchen. The upstairs CO detector is located outside a spare bedroom. The third CO detector sits on a ledge in the main area of the basement. There are different styles of CO detectors—some plug in to outlets, others need to be mounted on walls or ceilings, and some rest on tabletops or ledges. In my house, I have two CO detectors that plug in to outlets and one that rests on a ledge, so they were super simple to set up. If you purchase a model that needs to be mounted on the wall or ceiling, it will require a little more setup, but it’s fairly similar to installing a smoke alarm. If a burglar enters your home through a door or window with a door/window sensor on it, the sensor will detect the motion and trigger an alarm. The door/window sensor sends a signal to the control panel, which then communicates with the central monitoring station (or your smartphone, if you don’t have professional monitoring). It’s a good idea to have a sensor on every door and window, but you may want to purchase additional sensors over time to spread out the cost. (Plus, it may be more cost effective to purchase a glass break sensor or image sensor instead of multiple window sensors, but we’ll discuss that below.) If you want to spread out the cost, we suggest starting with sensors on all entry points on the first level and then expanding from there. If a door or window looks like an easy spot for an intruder to access, it should be one of the first places that gets a sensor. Burglars like dark, hidden areas, so you’ll definitely want to monitor places like back doors and windows behind shrubs. You should also place sensors on bedroom windows. When you install your door/window sensors, make sure the surface is clean by wiping it down with a wet cloth and allowing it to dry. Place the sensors at the top of doors and windows so they are less noticeable and less likely to get knocked around. Each company has different recommendations regarding how far apart to place two pieces of a door/window sensor, so be sure to read the instructions carefully. Fire, heat, and smoke are typically detected within one alarm, but it’s important to check the sensor to ensure you have all three problems monitored. If the detector senses one of these issues, it emits an alarm. Depending on whether your detectors are interconnected, others in your house may sound as well, ensuring everyone in the house is alerted. The NFPA recommends having at least one fire alarm on every level of your home. Additionally, you should have a smoke detector in every bedroom. We also recommend placing fire detectors near attics, in living rooms, and on the landing areas between floors. My house has six fire alarms and I’m thinking we could use at least one or two more to cover the basement and living room. 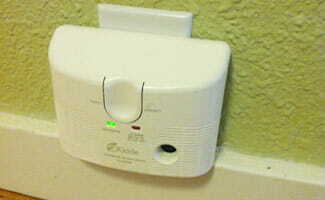 Fire detectors should be placed near doorways toward main areas. For example, in bedrooms, you should be put a detector near the door to the hallway rather than by the closet. That way, the smoke alarm will sense the fire sooner if it’s closer to the source. Before you install your smoke alarm, make sure you read the instructions carefully. There are two types of fire detectors: wired and wireless. The benefit to wired smoke alarms is that if one sounds, all the alarms connected to it sound as well. 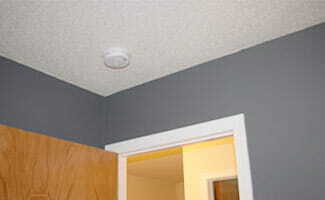 However, wireless smoke alarms are easier to install. Check your state’s laws to see what requirements there are for smoke detectors. If you have a wired detector, you may want to have a professional install it for you. If you’re installing it yourself, be sure to measure correctly and use a pencil to mark any areas that may require pilot holes. 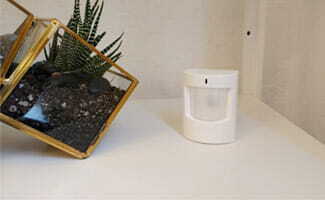 A flood sensor alerts you if there is an excess of water in the location where the sensor is. If the sensor detects extra water, it alerts the central monitoring station (or you) that there may be a flood. These sensors help warn you before a leak from a broken pipe or appliance gets out of control. So instead of coming home to water up to your knees, you get enough advance notice to shut the water off and save any valuables—not to mention save a lot of money on repairs. The most important place to have a flood sensor is the basement or first level of your home. Many homeowners place flood sensors inside the sump pump so they’re alerted before the water reaches their basement. If you don’t have a basement, the kitchen, laundry room, or somewhere near the water heater is a good place for a flood sensor because of the appliances and sinks that are connected to the water. The detector should be mounted on the lowest part of your wall or even directly onto the floor in order to detect the water as soon as possible. For example, you wouldn’t want to install a flood sensor 12 inches from the ground because you won’t know there’s a problem until there’s a foot of water. Most flood sensors are peel and stick, but make sure to read the instructions carefully as installation may vary. Freeze sensors detect when temperatures are close to freezing in your home so you can take action before damage occurs. The temperature that triggers the system varies, but it’s generally around 41°F. The sensor alerts you before temperatures hit freezing so your pipes don’t freeze, costing you thousands of dollars in repairs. Some freeze sensors can be used only indoors because they are not weatherproof, so make sure to check your sensor prior to purchase and installation. If there is a room in your house that needs to be a certain temperature because it holds important objects like antiques or art, you’ll want to have a freeze sensor in it. We recommend placing freeze sensors in your basement and attics as well, since those are both places that have more water pipes and are less lived-in. Other places to place freeze sensors may not be immediately obvious. For example, having one near the thermostat can help you discover your thermostat isn’t working properly. Bathrooms and kitchens usually have exposed plumbing which can be vulnerable to bursting if they freeze. Another good place to have a freeze sensor is at a vacation home or in a second home that you are away from frequently. Lastly, if you have a pool, fountain, or sprinkler system, we recommend placing a freeze sensor near it because it can be a convenient reminder that it’s time to winterize your water features. Some freeze sensors can be installed directly on pipes, but you’ll want to check the type you purchased before installation. A common installation option is on a wall near the area you want to monitor. Most companies’ freeze sensors are peel and stick (like the flood sensors), so they’re fairly simple to install. 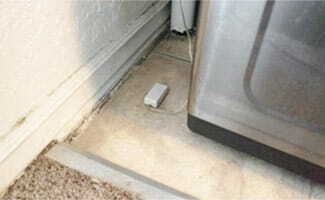 You’ll want to make sure you install the freezer sensor in a spot that isn’t drafty—a breeze could set the sensor off, creating a false alarm. Glass break sensors are used near windows or glass doors, and they contain a microphone that detects the frequency of breaking glass. These sensors are great alternatives to window sensors if you have a lot of windows, because one sensor can monitor multiple windows. Glass break sensors average about 20 feet in range, so they can cover a large area, making them ideal for living rooms or other large rooms. Instead of purchasing three window sensors for your living room, you could purchase one glass break sensor to cut down on the pieces of equipment you have to purchase and install. Glass break sensors are generally used in conjunction with motion sensors in larger spaces with multiple windows. That way, if someone breaks your window, the glass break sensor is triggered. 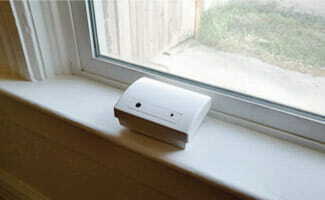 If someone enters your home through an open window, the motion sensor is triggered. Depending on your home’s size, you may want more than one glass break sensor, but we recommend having them in living rooms and sitting rooms because they typically have more windows. Glass break sensors are generally peel and stick and can be placed on walls or ceilings. We recommend placing the glass break detector on the wall or ceiling opposite of the windows being protected. Make sure you place the sensor within 20 feet of the windows so you have all areas covered. You’ll also want to make sure there’s no couch, wall, or other furniture blocking the path between the windows because it can prevent the sound from traveling to the sensor. An image sensor is basically a motion sensor with a camera built into it. 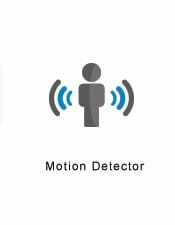 Image sensors detect motion, snap a photo of the activity, and alert the monitoring station (or you). Some image sensors do not detect subjects under a certain size, making them pet-friendly. Getting inundated with photos of your dog while you’re at work wouldn’t be the worst thing in the world, but it could be a bit distracting. Image sensors are good replacements for multiple door/window sensors. Image sensors should be placed across from the windows or in an area directed toward a large open space so they can detect motion and capture photos for as large an area as possible. We recommend having an image sensor in the living room or any other open space. Image sensors should be installed at eye level or higher, depending on the instructions and camera angle of the image sensor. You wouldn’t want to place an image sensor near the ground because identifying an intruder’s feet is more difficult and less helpful than their face. Most image sensors are peel and stick, so installation is fairly simple. Motion detectors are a basic part of a home security system—practically every security company has some type of motion sensor. If someone enters the range covered by a motion sensor, the alarm will alert you or the monitoring center. Motion sensors should be placed in any room you want monitored, whether you want to keep track of when the kids sneak into your office or get instant alerts when an intruder enters your house. 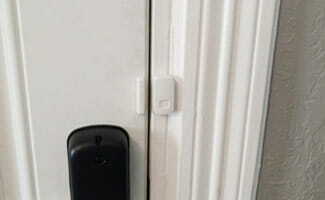 These sensors are best used in rooms that have many doors or windows because it’s less expensive to buy one motion sensor than to buy door and window sensors for each door and window. Like most sensors in this article, motion sensors are generally peel and stick. However, there are some motion sensors that can be placed on a tabletop. If you have a peel-and-stick sensor, make sure the wall is clean and dry before installation. Read the instructions carefully before placing a sensor on a wall, because the angle and distance can vary. If you find that your pet triggers your motion sensor, you may want to consider installing the sensor upside down so it doesn’t detect motion for lower areas. This may not be possible with all motion sensors, so check with your security company before doing this. Most companies recommend the sensor be four to five feet off the ground, or approximately eye level. Many companies recommend placing them in corners because motion sensors perform best when the intruder walks past them instead of toward them. Tilt sensors are placed on objects to make sure they are kept stationary. When the object moves, it sets off the tilt sensor attached to the object. Tilt sensors are commonly overlooked, not only by homeowners, but by security companies as well, since few offer them in their equipment lineups. 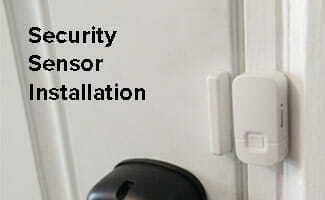 However, we think these sensors are an important part of a home security system. Popular locations for them are on garage doors, hatches, and sheds. We definitely recommend having a tilt sensor if you have a garage door. Tilt sensors are fairly simple to install and are peel and stick. If you place one of these sensors on a garage door, it should be towards the top of the door and in an upright position. Simply peel the sticker, place the tilt sensor in the desired location, and press firmly to help it stick to the item. What sensors do security companies offer? The most important thing to remember is that peel-and-stick sensors need batteries. We recommend you check the batteries for all of your sensors twice a year. A good time to do this is daylight saving time because you’re already changing the clocks in your house, so it’ll only take 10 more minutes to check the sensors too. If you want to learn more about the equipment in this article plus more, check out our ultimate guide to security equipment. Do you have any tips for installing a sensor in your house?